On this page we’ll recognize FPUMC members accomplishments both in the church and in the community, plus highlight special events involving the church. 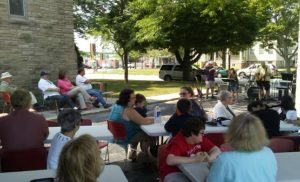 Church Picnic – 8/19/18: Fountain Park Church held it’s annual church picnic on Sunday, August 19th on the church grounds. Activities included games such as Bingo for all ages included prizes. A great lunch with many delicious desserts was served while drawings were held for numerous fabulous gifts. 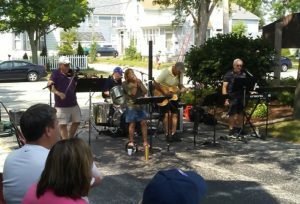 Entertainment was provided by a local Christian band, Morning Star. It was a beautiful August day to share with Christ’s people. (July 25, 2018): About five dozen church members and guests enjoyed an evening eating Russian food celebrating how people in Russia during Christmas. Food included the main course, Golubtsy (stuffed cabbage with meat – Right/top), Borshch (soup – Left/top), Shuba Layered Salad (herring, eggs, beets, carrots, potatoes – Left/middle), Krab i Kukuruzy Salad (crab & corn), Russian Sausage (From Brockman’s Market), Oivje Salad (meat, potatoes, carrots, eggs, peas & pickles), Shirazi Salad (cucumber, oil, vinegar, dill & onion), Kutya Wheat Pudding (grains, dates, cranberries, cream & lemon zest), Russian Cream Dessert (Right/bottom), Pryaniki (spice cookies – Left/bottom), Sbiten (spiced honey drink), White Russian Coffee. After the dinner, Pastor Warren Waddell presented an interesting power point show describing his experiences doing mission work at Volgograd, Russia. The dinner was a fund raiser for his coming trip back to Volgograd in November. A free will offering was taken. 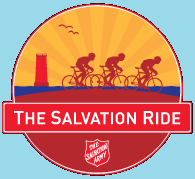 Salvation Ride (July 7, 2018): The Ride is much more than a fun day on two wheels: every dollar raised and each mile biked provides critical support for those in need through the Salvation Army that goes directly to those in Sheboygan County. This year marked the 5th annual “Ride” (not a race). There are five routes: 10, 25, 50, 62.5 and 100 miles. There are well-stocked Rest Stops providing snacks and refreshments along with rest rooms along each route. 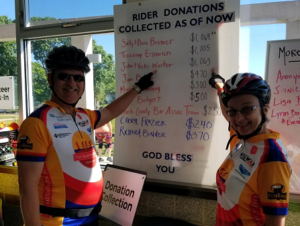 John & Vicki Winter participated in The Ride again this year. With your help and a few other outside donations, we raised a combined total of $1,065! You made us the #2 top private fund raiser. This year there was a total of 418 riders. Next year’s Ride will be on July 6, 2019 – rain or shine. John & Vicki really look forward to having more members from our church family join in The Ride. Feed My Starving Children (October 14, 2017): Several FPUMC members & friends participated in packing sessions for FMSC. During the session on Oct. 14th, FPUMC members were part of a group of 124 volunteers from numerous local churches. A total of 153 boxes were packed that contain 33,048 meals. That would be enough to feed 91 children for a year. It was an fun and awesome time!! Happy Hearts “Wisconsin Dairy Industry” Program (August 10, 2016): During the August Happy Hearts program, Sheboygan County Dairy Ambassador, Marlene Kammann, gave a presentation about the dairy industry in Wisconsin. She shared information about Wisconsin’s Signature Dairy Industry. Prior to the program, she invited everyone to join in some cheese tasting made locally. Guests learned that Wisconsin is by far the #1 producer of cheese in the country, and our state is #4 in the entire world in cheese production. Plus 96% of all Wisconsin Dairy Farms are family owned. Wisconsin set a record for milk production in 2015 at over 29 billion pounds. Cheese production reached a milestone in 2015 topping 3 billion pounds. At the World Championship Cheese Contest, Wisconsin earned 127 awards. That is more than the other 49 states combined. It was an interesting program and we are proud to be called “Cheeseheads”. Additional photos are posted on the Photo Gallery page. The Happy Hearts program is presented six times a year during the even months with a variety of programs and entertainment.